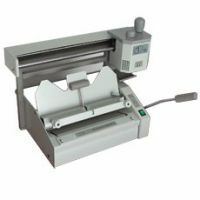 920 series desktop glue Binders are special for enterprises and institutes offices. 920 series take advantage of both 950 series and 970 series technologies and own several patents. Micro-computer control: book test, clamp test, milling cutter test, glue-roller revolve and clamp table are all auto-sensor. 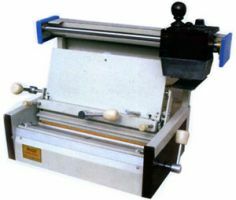 The time of putting book, the time of putting cover, the pressure of clamping book can be adjusted according to your need. Eight kinds of self-check, error warning display, error correction, these designs make you familiar your machine quickly. Two-circuit air-break switch, leakage circuit-breaker, high temperature safety cover, guard's valve, and other safe warning make you relax. Fashion and internationally design of appearance. Vertical clamp cover patent is another great technological break-through of products which are different from the products of other companies, clamp-cover-table rise and accomplish book without any letup; structure sample and reliable, bind perfectly, become the target plagiarized for a time. Height of clamp table adjustment technology: the left and right clamp tables are both adjustable to efficaciously control the square and the round of the book back shape. 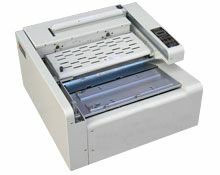 This machine can adapt to meet the different requirements of the book with different thickness. 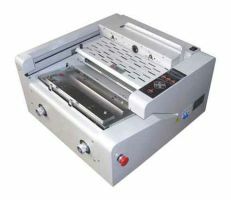 Even applying-glue after single trip of book even with common adhesive glue greatly reduces costs, compared to other machine, our machine is more convenient and efficient. Large capacity of glue tank meets demand of mass production. Broad outspread of book, up to 150'(limit to appointed glue).